How to Use Wireless Lavalier Microphone? Larger or uneven atmosphere of the actor, but also should pay attention to the microphone to avoid the main atmosphere and the windshield, or there will be gas explosion, affecting the actor's feelings and the audience's hearing emotions. Of course, the mechanical strength of the audio cable material is limited, leaving a certain amount of retractable margin, to avoid the tensile force to change the direction of the microphone or even cut off the cable. wireless Microphone and the lips about 20cm distance, and the performance of the actors when the head swing larger, in order to avoid the resulting sound suddenly weak, it is recommended to use omnidirectional microphone to ensure that the same direction of the microphone can also increase Pin reinforced. 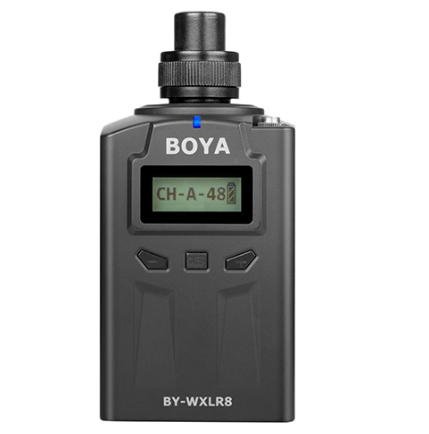 The BY-WXLR8 Plug-On XLR Transmitter for BOYA BY-WM6 and BY-WM8 UHF Wireless Microphone System. Allows you to connect any XLR microphone and the BY-WM6 and BY-WM8 wireless receiver. Experienced performers wireless microphone is very particular about, will not cover or hit the microphone affect the impact pickup, and know the transmitter on the switch and the button can not be easily mobilized, the battery power situation should always pay attention, but also according to each line, The importance of each piece of singing to grasp the breath of the microphone, because it determines their own voice to play and the audience's approval, and only so that even for up to two hours of performances can easily ease the word round. So, the performance of the sound effects of the opera is not purely sound designer decided, to a large extent, also depends on the cooperation of the actors. Of course, it is necessary for the opera sound engineer to master the using skills of the lavalier wireless microphone and understand the features of the opera sound. In order to solve this old problem, due to the distance between the wireless microphone and the lips and the deviating angle, there is a certain loss in the treble part. In recent years, the opera sound engineer and the manufacturer's engineer have eliminated this concept difference and reached a consensus. Specifically 2.5-6.5KZ high-frequency part of the machine made on the upgrade about 8db compensation.